SAI-T9 system, Detorid region. On the 23rd of September at 21:54 EVE Standard Time, a major battle unfolded in the system between Triumvirate. [TRI.] and Drone Regions Federation (DRF). The battle was fought over the IAS-I5 system’s infrastructure hub belonging to Triumvirate. The system functions as Triumvirate.’s main staging and a loss of an infrastructure hub could potentially hamper its function. Especially in regards to services such as cynosural generators and jump bridges which are tied to the strategical index of a system and kept by the infrastructure hub. Triumvirate. Decided that rather than to try and defend the infrastructure hub in the conventional sense created by Aegis sovereignty, to instead use the timer to elicit a fight from its opposition. The alliance had assembled a Machariel battleship fleet which was supported by a League of Unaligned Master Pilots [LUMPY] Gila cruiser fleet and later reinforced by a Red Menace Coalition (RMC) Ferox battlecruiser fleet. Against this, Drone Regions Federation assembled three fleets of its own; two Machariel fleets and a Ferox fleet. The Machariel fleets bridged IA5-I5 system and prepared to engage Triumvirate. near its Fortizar citadel while the Ferox fleet was still on its way. Triumvirate. chose to change the venue and led the hostile fleets to the SAI-T9 system. This was done to allow Triumvirate. to jump in capital ships for escalation, as both sides had prepared a considerable amount of capitals for the event. The Triumvirate. 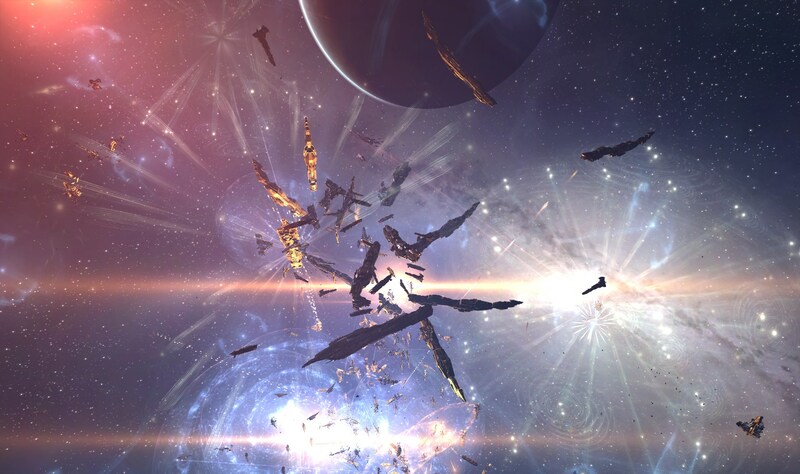 Machariel fleet settled in the SAI-T9 system on the IA5-I5 gate and maintained long distance from the gate. The fleet had also acquired a couple of Apostle force auxiliaries in order to augment its logistics wing. 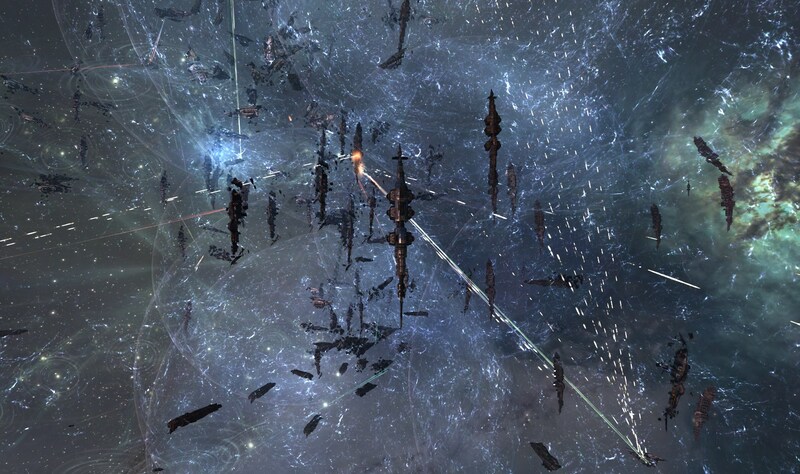 Both the Gila and the RMC Ferox fleets too took positions from the gate and awaited the Drone Regions Federation move. Drone Regions Federation decided to engage, its two Machariel fleets landed on the SAI-T9 gate in IA5-I5, jumping through to the expecting defenders. The two battleship fleets uncloaked and anchored up as both sides opened fire on each other. The battle began with a long range slug as the Machariel fleets kept their distances, artillery cannons hammering each other from ranges of 100 kilometers. Triumvirate. became the focal point of the DRF fleets, while the defenders didn’t discriminate between the two Machariel fleets and sorted mainly by distance. The initial exchange proved favorable for the defenders as the Drone Regions Federation lost more than twice the ships in the artillery battle. However, the DRF reinforcements made it to the battle. The Ferox fleet had arrived via an alternate route and probed down the Triumvirate. Machariel fleet. It warped on top of the battleships and began brawling them. At the same time, the Gila fleet found itself in the crosshairs of the DRF battleships. The agile cruisers were no match to the artillery barrage and each volley took down another Gila. The Triumvirate. fleet found out that it could easily tank the Ferox fleet, its main issue remaining being the volley damage of the hostile battleships and thus it kept its attention focused on them. Instead, the RMC fleet was given the task of removing the DRF battlecruisers from the field. The RMC Ferox fleet targeted its DRF counterpart and started hammering it with its railguns. The DRF Ferox fleet, however, kept its attention on the Triumvirate. fleet, even as it started bleeding ships. The Gila fleet soon joined the RMC fleet in dismantling the hostile Ferox fleet, its drones descending on the battlecruisers and tearing them apart. The Drone Regions Federation chose to slowly escalate matters. Trying to bait the Triumvirate. capitals and destroy the force auxiliaries at the same time. The DRF Ferox fleet lit a cynosural beacon and ushered through it four dreadnoughts. The dreadnoughts materialized on the field and entered their siege cycles, targeting one of the Apostles. The Machariel fleet reacted immediately, focusing its fire on the dreadnoughts and bringing them down in rapid succession. However, the hostiles were able to bring down one of the Triumvirate. Apostles in return, the combined firepower of the different fleets and the dreadnoughts enough to push it over the edge. Though losing a significant part of its logistics wing, Triumvirate. soldiered on, its attention returning to the DRF battleships. The DRF tried to escalate matters again, this time bringing to the field 8 combat carriers. The capital ships landed on the field and launched fighter squadrons, focusing on the Triumvirate. battleships this time. The RMC fleet was given a new target in the form of the fighters, the Ferox railguns more suited to tracking the relatively fast fighters which descended upon Triumvirate.’s fleet. The RMC’s firepower blasted the fighters in droves but the battlecruisers soon came under fire from the DRF battleship fleets. Battlecruiser after battlecruiser succumbed to the artillery barrage and exploded, increasing casualties on the defending side, even as Triumvirate. continued to volley through the DRF Machariel ranks. With Triumvirate. refusing to escalate, Drone Regions Federation tried to up the ante, bringing in a dreadnought squadron while the combat carriers continued to slowly burn away from the center of battle, ignored by the defenders. Finally Triumvirate. chose to respond in kind, bringing a couple of squadrons of dreadnoughts. The two capital forces started to brawl at close range, each side bringing more and more dreadnoughts as they tried to gain capital dominance. Dreadnoughts exchanged fire as the sub capital fleets flew around them, busy with their own individual fights. Triumvirate. kept targeting the hostile battleship fleets, whittling down the number of their mainline ships. The DRF and RMC Ferox fleets though suffered the worst, each side pouring its wrath on the relatively bulky and fragile battlecruisers. The Gila fleet, though suffering the occasional loss, continued to lend its remaining firepower as much as it could even as the battle turned slowly into a capital slug. The Drone Regions Federation brought in more dreadnoughts to counter Triumvirate.’s, raising their capital force into a full wing. Triumvirate. decided to go all in with its dreadnoughts and brought in the reminder of its reserve. 8 squadrons of dreadnoughts squared off the five that the Drone Regions Federation had assembled. However, the Drone Regions Federation was far from done and finally brought its second reserve in. Another Drone Regions Federation dreadnought wing materialized on the field. This swung the capital fight decidedly in the Drone Regions Federation’s favor. Though Triumvirate. and its allies were able to hold their ground in the sub capital arena, they were steadily losing the capital exchange. The dreadnought battle raged on but as the trade between sides remained fairly equal, the Drone Regions Federation with its slight numeric advantage would certainly emerge victorious as their opposition dwindled. Triumvirate. was ready for this from the start. It had amassed a whole super capital wing comprised of super carriers and titans with a few squadrons of force auxiliaries ready to support the behemoths. However, it was at this point as the capital tide was turning against it that things went awry. The original beacon for the super capital fleet was lost at the start of the battle and a replacement was rushed in only to find out it lacked fuel to activate the cynosural generator. With things becoming dire with every moment, the fleet commander of Triumvirate. had no choice but to slowly burn into position and light the beacon from his flagship. It took a few grueling minutes as Triumvirate. capital ships continued to fall for the Legion strategic cruiser to arrive in position, at range of the dreadnought melee so as not to risk a loss of a super capital right from the bat. The beacon lit up and first came through a wave of super carriers and force auxiliaries. The super carriers deployed fighter bombers and sent them at the hostile dreadnoughts, torpedoes loaded and ready to strike the immobile capital ships. With the force auxiliaries and super capitals settling down after their materialization, the titans followed, unleashing doomsday devices at the opposition. The Drone Regions Federation declined to further escalate matters. With Triumvirate. having put its super capitals on the field, it was time to withdraw what remaining capital ships it had. 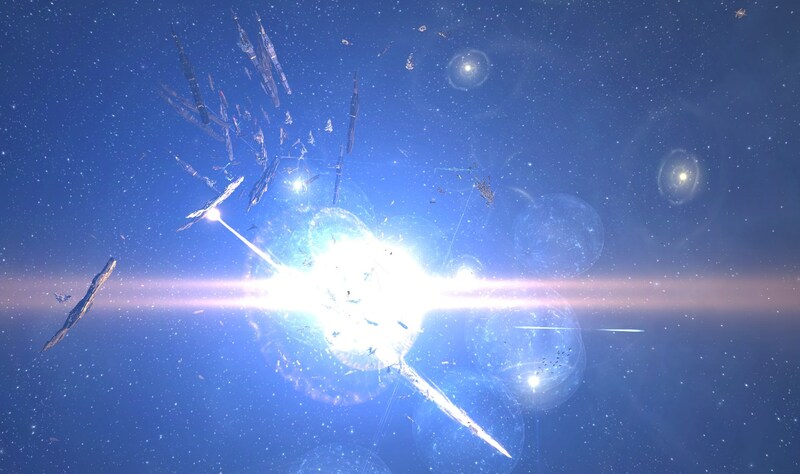 Dreadnoughts were given the order not to siege again and once they had cleared the siege cycle, injected cap boosters and jumped out if possible. Triumvirate. tried to destroy as many as it could but the constant fighting had depleted its tackle wing. Thus a few dreadnoughts managed to escape the massacre as well as most of the combat carriers. That said, most of the dreadnoughts deployed by the Drone Regions Federation were not able to save themselves, the vast majority falling to Triumvirate.’s onslaught. The Drone Regions Federation’s capital withdrawal was soon joined by its sub capital one. The two Machariel fleets had suffered heavy losses compared to their Triumvirate. counterparts, losing nearly half their mainline ships. 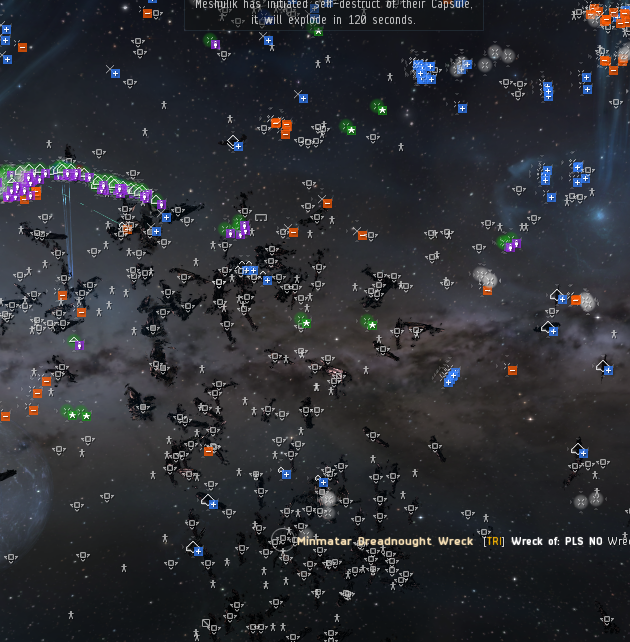 The DRF Ferox fleet fared worse, almost completely wiped out by the defenders. Triumvirate. and its allies didn’t escape unscathed, having lost a two thirds of their capitals as well as the RMC Ferox fleet. The rest of the defending fleets had been bloodied by the constant fight however held the field. That said, the battle for the infrastructure hub was far from finished. Triumvirate. focused mainly on extracting its remaining forces as skirmishes flared up over control nodes throughout the constellation. Opting to give its pilots a rest rather than try to contest the various interceptor fleets that roamed the area, Triumvirate. stood down and allowed the infrastructure hub to be destroyed, thus conceding the strategic objective to the attackers. Yet Triumvirate. did not let the attackers install their own infrastructure hub in turn, instead deploying an infrastructure hub to replace the one lost and bringing it online. With the infrastructure hub replaced, all sides finally disengaged completely, ending the fighting for the night. Battle report for the SAI-T9 system can be found here. All told the battle lasted 51 minutes with Time Dilation ebbing and flowing throughout the fight, sometimes reaching heights of 50% before completely subsiding. The system itself hosted nearly 800 pilots at the height of the fighting. Triumvirate. 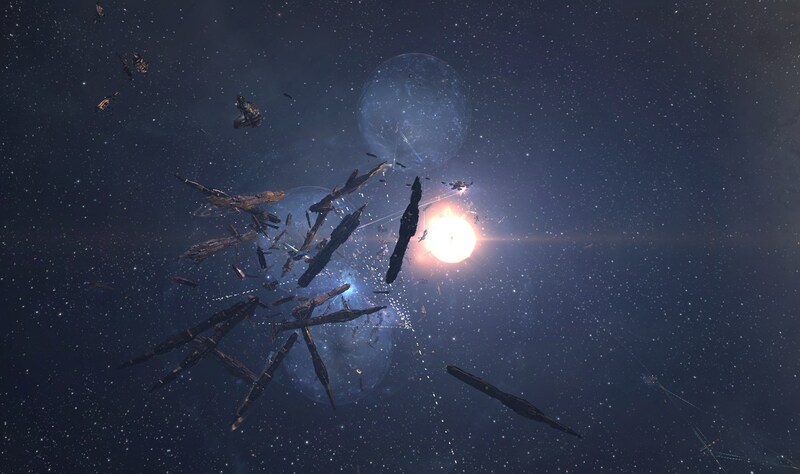 And its allies lost a combined 193 ships including 58 dreadnoughts, 1 force auxiliary, 20 battleships, 51 battlecruisers and 12 cruisers for a total of 207.82 billion ISK damage. 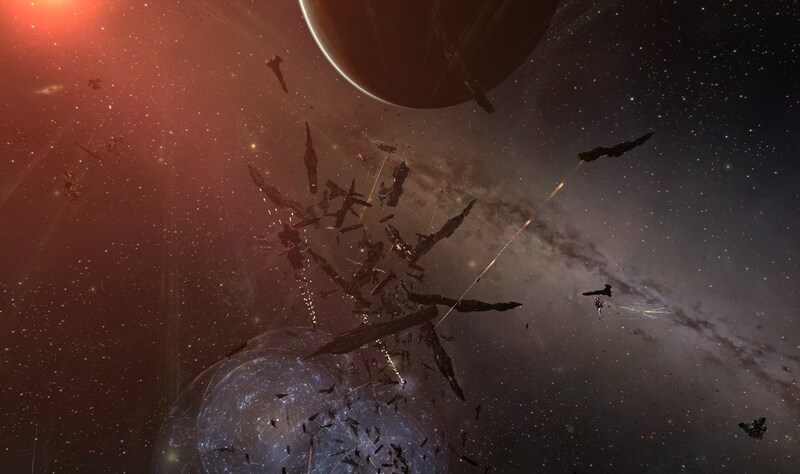 Drone Regions Federation lost a total of 316 ships including 89 dreadnoughts, 5 force auxiliaries, 1 combat carrier, 73 battleships and 64 battlecruisers for a total of 378.36 billion ISK damage. If you enjoyed this battle report, please consider supporting CZ.